They use the term, counting on the stupidity of people educated in public schools (Yah government! ), but they are coy about what they really mean. They always point to Sweden and Denmark and Norway when they talk about “socialism,” as if those were their role models (and as if America was full of Swedes, Danes, and Norwegians instead of being a melting pot of immigrants with a radically different history and culture). Yet, how come we always see the most excited champagne socialists trekking off to visit the dictators in Havana and Caracas and not the elected leaders in Stockholm, Copenhagen, and Oslo? Oops, Venezuela is the socialist paradise that dare not be spoken of. I guess when people are so equal they all have to break into the zoo to eat the zebras, equality stops sounding so awesome. But see, Venezuela isn’t true socialism. Nothing is ever true socialism, which is super convenient since any country that has ever dabbled in socialism tends to run short of food, medicine, and toilet paper. But I bet smart people like Gulag Barbie can totally make socialism work this time, and you’ll be prosperous and free and have your own pet unicorn. Socialism is a train that, once you board, never stops except if you derail it – which we would have every moral right to do if this hateful creed were imposed upon us. You see, socialism is the doctrine that people like you and I get to slave away for the benefit of the people those in charge decide are worthy – especially those in charge. 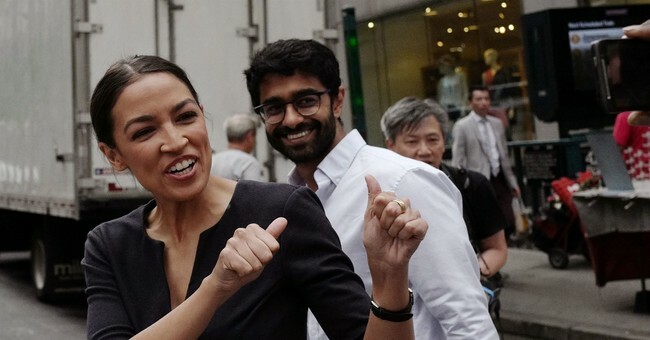 Do you think when there’s socialized medicine you’ll find yourself on a six-month waiting list to get a wisdom tooth pulled next to Alexandria Ocasio-Cortez or any other bigwig? I bet Chet thinks so. They don’t say it, but we Normals are the engine that they intend to power their socialism. We’re supposed to continue working and building and creating just as hard as we did when we kept the rewards. Note how the recipients of socialism – the elite, the bums, the hipster doofuses with their stupid Che T-shirts – never seem to expect that they might be asked to sacrifice too? We’re supposed to give up our property and labor to benefit them, but what do they contribute? New grievances? As my new book Militant Normals explains in non-FCC compliant terms, we regular Americans are woke to this scam – we understand that all this socialist posturing is just another way to hand us the check for the deadbeats who vote for Democrats while stripping us of any say in our own governance. Marxgirl wants to start off with free college, which means you pay for other people’s college too. Notice how there’s no expectation that her fans contribute toward the benefit they are receiving? And then she’s for free health care, which means you pay for other people’s doctors too. Again, the recipients are not expected to work for their own benefit. Want to guess what she wants to do with the means of production? And with private property? And the rights of people who oppose her schemes?